Well, obviously I have an answer – otherwise I wouldn’t pose this question to you. Use other people’s knowledge and skills! Better yet, I’ll give you a few examples. There are tons, but I’ll start with three. 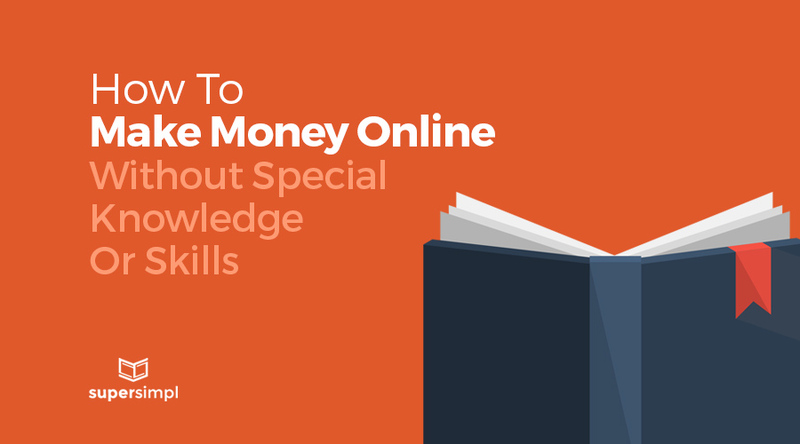 Three ways to make money online when you don’t have special knowledge or skills. BONUS: Grab this free resource, The Quit Pinching Pennies Roadmap: The 10-Step Plan for Building a $1,000/month (or more) side buiness or blog, plus tons of other exclusive resources and guides. This idea is not new at all. Although in the context of making money online, perhaps it’s new to you. Walmart doesn’t make products. They sell stuff other companies make. Amazon doesn’t make products. They sell products for other businesses and individuals. But did you know that Amazon has a program set up just for you? It’s called Fulfillment By Amazon. It allows you to sell products on Amazon’s website so you can make money online pretty quickly. You ship the items with your own labels on them to Amazon’s warehouse. Amazon posts them on their website and then collects the money, and ships them for you. Jessica and Cliff Larrew make over $100,000 per year buying items at a big discount and then selling them via Amazon’s FBA program. I don’t have time to get into all the details right now, but in short, they find products in stores that are discounted by 50-90% and sell them for retail value on Amazon. One way businesses increase sales for their products, services, or digital goods is by having a bunch of people with other websites actively sale for them. These website owners send people to the business’s website to make a purchase. In exchange, the business sends them a commission. Usually a percent of the total sale. We’ll use Amazon as an example again. I am an affiliate for Amazon. I have a unique link that I use to send people to Amazon. So if I send people to Amazon through my affiliate link, and they make a purchase in the next 24 hours, I get a small commission on that sale. It’s usually a few cents or dollars for Amazon. Could be more depending on what people buy and how many people you refer in a given period. But larger companies, like website hosting companies for example, will often pay out $50 to $200 per sale. For a professional website, I recommend WP Engine for hosting. In fact, I host 90% of all of the websites I manage on WP Engine. They are more expensive than the cheap mass-market hosts, but you pay for what you get. Their customer service is phenomenal. As a happy customer and someone who likes to recommend them (even if they didn’t pay me), I am set up as an affiliate. If you click on this link and end set up a hosting account, they will pay me $200. But, it’s good business for them – they get referrals from happy customers. They also get your long-term business – most people don’t switch hosting companies very often. So it’s a win-win. Cliche, but true. And the good news for you is that there are thousands of affiliates out their in just about every industry and niche. The options for making money online with affiliates are practically limitless. What do I mean by curate knowledge? Larry King and Oprah Winfrey didn’t become famous for their knowledge. They became famous by interviewing others. In short, they curated knowledge, experience, and fame. And they made money doing it. You don’t have to be Larry or Oprah to make money curating knowledge online. You can read books and post your thoughts like Maria Popova at brainpickings.org. Or you can interview hundreds of entrepreneurs and use the audio to create a podcast, like John Lee Dumas of Entrepreneur On Fire. The point being, you don’t have to know everything there is to know about a topic to make money online from it. Just being interested and asking lots of questions might be enough to do the trick. Well, there are three main ways that people make money online, no matter what they know or how experienced they are. I’m not sure where you are getting your information, but great topic. I need to spend some time learning much more or understanding more. Thanks for great information I was looking for this information for my mission. wow this is a great article about online earning, thanks for this article I was looking for this information for my mission. Good and knowledgeable article thanks for sharing. Well Affiliate marketing isn’t as easy as it used to be before. You cannot create an Affiliate web-store without getting banned from Google for being overly promotional.